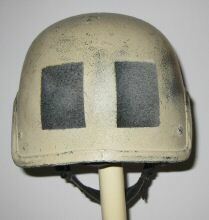 No real information, except that this is produced by a company called Armour Factory that had an establishment in Kuala Lumpur. It had previously traded as Sri Jentayu Global Sdn Bhd. Armour Factory no longer trades under that name and may no longer exist. 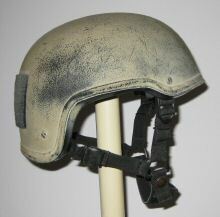 "This is a British-used helmet from Afghanistan. 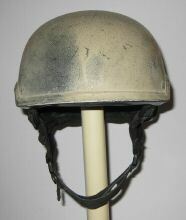 It's similar to the "Kejo" style helmets (see USA section) but the shell is thicker although it's pretty much the same weight. 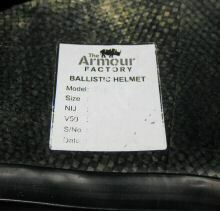 It has an "Armour Factory" label. 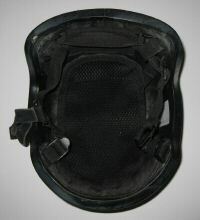 The strap / harness is unusual in that it is not attached directly to the shell at the rear - it passes through loops which are themselves attached to the shell. Weight - 1.15kg"